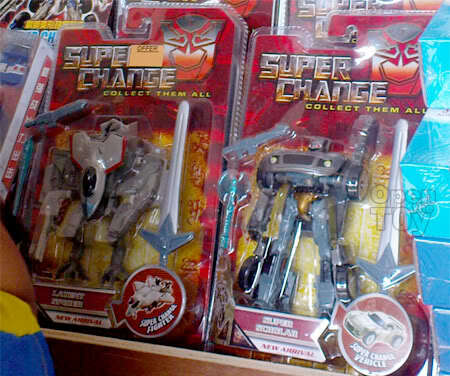 I saw these bootlegged Transformers movie figures as I was passing by a flea market at my old neighborhood on the weekend. They call themselves Super Change. Look at the card packaging. Do you notice the plastic seal packaging? It was just like NECA and Mcfarlanes card figures? If bootleg with their pricing which is half of the real toy can manage to factor into the cost in their quality packaging, why not Hasbros?. The card design was done professionally too and they had given the figures lots of accessories! That is what consumers want! At the same stall, I saw Thomas the Talk Engine train as a transformers and combiner. It comes with two packaging for consumers to choose from. 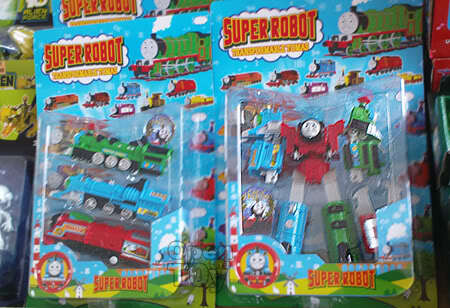 The card design was not as good as "Super Change" but it uses the theme of Thomas. It comes with chrome parts too! Here's the photo and news from Neatorama. Now consider what bootlegging has put in for their products. They not only copy but upgrade their products for their consumers. So what if the they use cheap plastic? At least they put solid thoughts on details. That is what counts. Stop those repaint stuff and for goodness sake please. Apply the "Do things right the first time" and stop milking us!! Come on toy collector. Speak up what you think. Updates: Dennis has a full review on Thomas the Transformers Combiners. Depends on what toyline the company is in. For example in Transformers series, I don't think Hasbro needs to make nice card packaging for its deluxe class figures as what Neca or Mcfarlane did. Consumers will take the figures out to play straight away and throw away the packaging like myself, seldom keep them in sealed packaging. For Star Wars series, who wants to invest in making a good quality card packaging for a 3.75 inch figure in large quantities? These figures may not be so popular in demand too. Hasbro is the one that comes out with original ideas to make their toys and not those copycats out there. Those copycats just spent money in making packaging only and copies the designs from the original companies that had spent a lot of money in research. So to me, I think we cannot compare the pricing between a copycat company and a official toy company. To me, I also don't buy fake toys even the packaging is nice and pricing is low. I do have some bootlegs Macross as gift from friends or I would buy them as comparison. Some bootleg/KO version/replica comes with different colour variants which can make addition collection. I don't despise them even though some were so inferior & poorly made that they were already broken before taken out from card. The 'Thomas the Train' Transformers are quite unique and I actually received this as a gift for my son's birthday. I believed a collector will know what's best to he/her. Inferior bootleg/KO version/replica can never undermine the original toy! I think Desmond hit the nail on its head. There is no apple to apple comparison between a copycat company and an official toy company. Besides R&D, there are also licenses cost and marketing and advertising cost. Anyway I like the 'Thomas the Train' Transformers...very unique...where can get and how much?? I fully agree on Opening the toy and cheap packaging. However there are some MISB toy collector who may want a better boxes or card. Starwars is history in most cases and now most toys hasbro doing is starwars sized (3.5 inches) and the price is higher than 5 inches less than a year ago. End of the day, consumer have their choices. I saw Thomas at a flea market few weeks ago and if I remember correctly it was selling slightly more than $10. If I happen to see it again will sms you? Never thought i see a thomas transformer let alone a combiner. That Thomas combiner is pretty great! Personally, I'm glad most of the toys I get don't come in the clamshell packaging. I hate how difficult it is to open. The word Beautiful is very appropriate for Thomas combiners. True. Clamshell package are great for those who want to keep the toy in package but it is also very durable should the toys are popular in retail where you know there is a possibilities that kids will messed it up in retail not to damage the figures such as Transformers.